We have had lots of teachers use the primary source thinking triangle with great success, so when Montana teacher librarian Ruth Ferris asked if we had an interactive version of this graphic organizer we knew it was time to create one. While it’s not high-tech, Ferris said it will help her model the process of completing the the thinking triangle. We have created versions in Google Docs and Microsoft PowerPoint®. 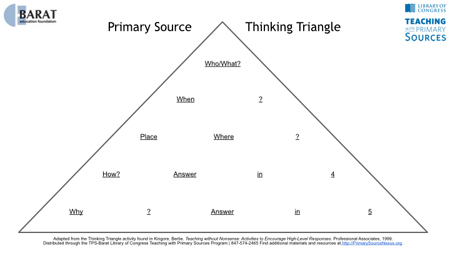 If you haven’t yet used the primary source thinking triangle, learn how to use this tool to connect to the common core. Please let us know how you use the primary source thinking triangle with students!